Eligibility for all fastpitch leagues is based upon a player's birth year, regardless of what grade she is in school. For 2019, if your daughter has a birth year of 2010 or 2011, she is eligible to play 8U fastpitch. This league was developed to encourage players who are ready for more than Machine Pitch, but who are too young for 10U fastpitch. It is a great way to introduce girls to fastpitch. In fact, 8U gives girls more at bats, and because there are no walks, it encourages the girls to learn to hit the ball. 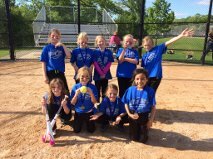 8U Fastpitch is sanctioned the same as our 10U, 12U and 14/16U fastpitch leagues through MN Softball. For the most part, 8U games are played by the same rules as 10U fastpitch softball – striking out, 3 outs an inning, etc. However, there is no stealing, no leading off, and no walks. Like 10/12U Fastpitch, there is travel to various locations around the Twin Cities. Coaches focus on the fundamentals of softball: throwing, catching, hitting, and base running. Players still hit off of a “machine,” the same machine that is used in Machine Pitch. New for 2019: All 2nd year 8U players (birth years of 2010) will be evaluated on March 1 and 9. Discussion will take place during team formation if an A team of 8U players will be formed. Fall 8U teams practice twice a week up until Labor Day, then only pratice once a week until the last full weeekend of September. Double Headers are typically located in the southwest metro (EP, Hopkins, Wayzata, Chanhassen, Bloomington, etc.) There may be some longer travel days, but usually no more than 1/2 an hour drive (the league sets the schedule). You will not know who/when/where until about a few days prior to the games. Game times are either 12/1:30 p.m. or 3/4:30 p.m.